Extended objects can have translational and rotational motion. To describe the motion of an unconstrained object, such as a football in flight, it is most convenient to treat the motion as a combination of translational motion of the center of mass and rotational motion about the center of mass. The motion of an object constrained to rotate about a fixed axis, such as a door rotating about a vertical axis defined by its hinges, is often more conveniently described as a pure rotation about this axis. If this axis is not a symmetry axis, the object exerts a force on the axis, and an external force is required to keep the net force on the axis zero and the axis fixed. In this laboratory you will become familiar with describing rotational motion. You will investigate the relationships between angular acceleration, moment of inertia, angular momentum and torque. Finally you will examine a simple model of a forearm. Open a Microsoft Word document to keep a log of your experimental procedures, results and discussions. This log will form the basis of your lab report. Address the points highlighted in blue. Answer all questions. Stand up and make a fist. Gently swing your arm in a vertical circle, pivoting at the shoulder and keeping the rest of the arm straight. Observe the motion of the arm. Pay attention to the motion of the elbow and of the hand. Use your data to answer the following questions. How far in degrees did the hand travel during the five rotations? How far in radians did the hand travel during the five rotations? How far in meters did the hand travel during the five rotations? What was the average angular speed (deg/s and rad/s) of the hand? What was the average linear speed (m/s) of the hand? What was the average angular acceleration (deg/s2 and rad/s2) of the hand? How do you know? What was the average centripetal acceleration (m/s2) of the hand? Answer the same questions for the elbow. Which quantities are different and which quantities are the same for the hand and the elbow? Use an on-line simulation from the University of Colorado PhET group to investigate the relationships between angular acceleration, moment of inertia, angular momentum and torque. Click the Intro tab explore the interface. Use your mouse to apply a torque to the wheel for a short time interval Δt to give the wheel an angular impulse and set it spinning. Slow the rotation rate with the brake. Watch the velocity and acceleration arrows for the bugs. Describe the direction of those arrows, while the angular speed of the wheel is increasing, constant, or decreasing. Set the applied force equal to 1.5 N.
Click Go let the simulation run for approximately 10 seconds. What is the magnitude and direction of the torque on the wheel? What happens to the lady bug? What provides the centripetal force to keep the bug moving in a circle? Why does this eventually fail? Click Reset All, and set the force to 0.5 N.
Observe the acceleration vector after you click Go. How does it change? Will the acceleration vector ever point directly to the center? Why or why not? Approximately 5 seconds after you click Go set the brake force to approximately 1 N.
What happens to the acceleration vector? Click the Moment of Inertia tab. Choose radians for the angular units. Set the scale of the torque graph to show a range of -20 to 20 Nm. Set the scale of the Moment of Inertia graph to show a range of -2 kg m2 to 2 kg m2. Set the angular acceleration graph to show -20 rad/s2 to 20 rad/s2. Put the mouse finger anywhere on the boundary between the green and pink circles. Hold down the left mouse button and move mouse. Look at the graph and try to apply a force that creates a torque of between 5 and 15 Nm. Use the ruler to measure the radius r of the boundary between the green and pink circles. Record r in your log. Calculate what the tangential component of the applied force must have been. Record Ftang in your log. Compare the torque τ and the angular acceleration α and calculate the moment of inertia I of the disk from τ = Iα. Record I in your log. Compare with the moment of inertia displayed in the graph. Record the comparison in your log. Predict what will happen to the moment of inertia if you keep the mass of the platform the same, but you create a hole in the middle (increase inner radius). Record your prediction. Set the inner radius equal to 2. Find the moment of inertia for this shape. Record it. Even when the force on the platform changes, the moment of inertia graph remains constant. Why? Click the Angular Momentum tab. Set the angular speed to be 1 rad/s. This fixes the angular momentum unless you apply a torque. While the disk is moving, change the inner radius to 2 m. What happens to the moment of inertia and the angular velocity? Make some more changes to the inner radius, outer radius and mass of the disk. Describe what happens. Take a meter stick with a paper clip to which you can attach a weight. (If you cannot find one, there are meter sticks, clips and weights in room 203, Nielsen Physics.) Grab the stick on one end, and hold it horizontal, with the weight close to your hand. Slide the weight out to other end. Does it become harder to hold the stick horizontal? Why? You are holding up the same weight. In this experiment, we will use the meter stick as an artificial forearm. 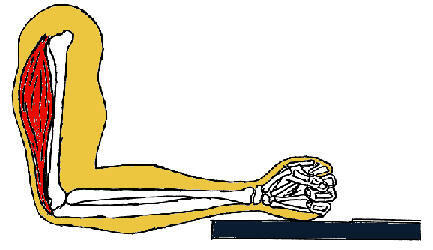 The arm (excluding the shoulder and wrist) is composed to two major segments. The upper arm is attached to the shoulder. The forearm is attached to the upper arm at the elbow. Let us only concentrate on situations where the upper arm is in the vertical position. Then the forearm can move in two directions, upwards or downwards. The upper-arm and the forearm can be thought of as two rigid levers, joined at the elbow which acts as a pivot point. Muscles attached to these levers provide the force required to articulate their motion. Since muscles can only provide force by contraction, they must always work in pairs. 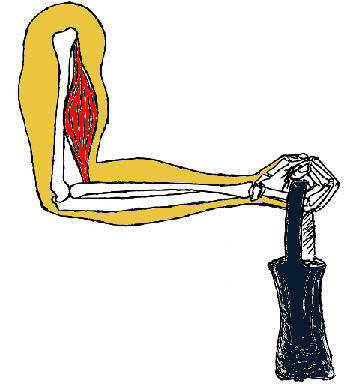 As the contracting muscle, (red), tightens, it applies a force to the arm. At the same time, the opposing muscle, (black), relaxes, thus allowing the arm to move. We have a pair of simple levers. When we lift a load with our biceps muscle, this muscle does positive work. The triceps muscle does positive work when we push down on something. There is also a third force on the forearm, the force the upper arm's bone exerts on the forearm at the elbow joint. This force does no work, because the elbow joint is not moving. 3 clips are attached to a meter stick, one at each end, and one in the middle as shown in the figure below. The stick hangs from the force sensor. The force sensor is used to measure the combined weight of the stick and the clips in units of Newton (N). The minus sign indicates that the weight points downward. Enter the magnitude of the weight into the table below. The center clip is moved to a position ~25 cm away from the left edge of the stick. Now the stick is no longer horizontal. You have to push down on the left end of the stick to bring the stick to a horizontal position. To find out how hard you have to push down to bring the stick to a horizontal position, a mass hanger is attached to the clip on the left end. Masses are loaded onto the mass hanger until the stick is horizontal. The combined weight of the masses and hanger equals the force with which you have to push down. Record the magnitude of the reading of the force sensor when the stick is again horizontal in the table. The table already lists the relevant distances. Paste your table into your log. Modeling the meter stick as a forearm and the force sensor as the biceps, compare the force that the biceps has to exert to keep the forearm horizontal to the force it has to exert to just support the weight of the forearm. Comment on the relative magnitude of these forces. List all the forces (magnitude and direction) acting on the forearm (meter stick) and calculate all the torques (magnitude and direction) exerted by those forces about the pivot point, when the stick is horizontal and in equilibrium. Do all the torques cancel out? Insert your log with the requested table and the answers to the questions in blue font. Save your Word document (your name_lab8.docx), go to Canvas, Assignments, Lab 8, and submit your document.